Binh Dinh (VNA) – A ceremony was held in Quy Nhon city, the central province of Binh Dinh, on March 31 in response to the International Day for Mine Awareness and Assistance in Mine Action (April 4). The programme, part of the joint mine action project of Vietnam and the Republic of Korea (KV-MAP), was organised by the Vietnam National Mine Action Centre, the Korea International Cooperation Agency (KOICA), the United Nations Development Programme (UNDP), and the Ho Chi Minh Communist Youth Union of Binh Dinh province. 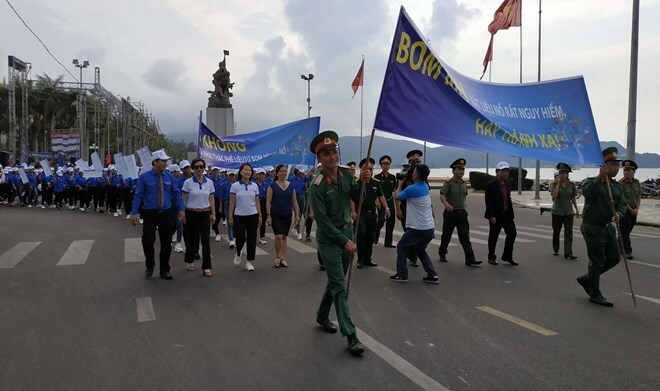 At this event, hundreds of local students and soldiers marched through big streets of Quy Nhon city to convey a message calling for joint efforts in addressing consequences of post-war unexploded ordnances (UXO). On this occasion, a painting contest themed “For a safe community free of UXO accidents” took place, attracting 100 students aged between 8 and 15 from schools across Binh Dinh province. The UNDP’s Assistance Country Director Catherine Phuong said the programme aimed to raise public awareness of UXO that is still threatening the lives of people in Binh Dinh although the war had ended decades ago, thereby helping to reduce UXO accidents. Vietnam is one of the most UXO-contaminated countries in the world. A report on the post-war UXO contamination in the country shows that all the 63 provinces and cities are polluted with UXO.